I haven’t done a giveaway for a while, so I thought today one lucky reader should have the chance to win a big sample lot from my own collection. I’d rather see these go to someone who is excited to explore them, than see them go bad unloved in my extensive sample storage box. I’m going to ship this treasure trove anywhere in the world. To be eligible to win leave a comment on this post stating three perfumes you always wanted to smell but didn’t get the chance yet. The giveaway is open until next Thursday, May 15, I’ll post the winner on the blog on Friday. As always, I cannot be responsible for lost packages or postal blunders. The samples are from my personal collection and I paid for the majority of them. This entry was posted in Giveaway and tagged Fragrance, Giveaway, Niche Perfume. Bookmark the permalink. It would be my pleasure, thanks for entering me! OK forgotten – Delrae Debut, vintage Diorissimo and JAR Bolt of Lightning. How wonderful & kind of you, Olfactoria! Three scents I would love to try and never had the chance to are Fetish Pour Homme by Roja Dove, Portrait of a Lady by EdP Frédéric Malle and Les Nombres d`Or Vetyver by Mona di Orio. There must be like a few hundrets of samples! Hi dear Birgit, such a nice gesture! As an addicted perfumista I`m always in search of interesting new scents, but untill now I didn`t got the chance to smell the work of the amazing Vero Kern (I only know Onda wich is so complex and rich) and I`m particulary interested in Kiki; next I`d like to explore some Guerlains from the high-end lines, like Cuir Beluga for example or Gourmand Coquin, and on the third place I am curious about Brulure de Rose from Parfumerie Generale. That`s it! Thank you for the chance, and good luck to everybody! I’m curious about JAR perfumes. For a while I was obsessed with mentioned above coffret for the Perfume movie. Other than that… Whenever I read that one of the people I follow loved/loves some perfume, I feel an urge to try it to smell what they smell. To win this would be 20 birthdays and Christmases all rolled into one! You are a generous soul. OMG, Birgit, you rock! What a plethora! What a treasury! I know all about keeping samples safe and sound, and fresh – it’s not easy at all! I am having hard time with about 20 4-years-old leaking vintage vials from a friend in Spain (Guerlain, Robert Piguet, Balmain, etc.). Cold and darkness, for sure, but how to stop the leaking process…? Well, worries aside! There are piles of perfumes I wish to try, and sometimes it turns that there are whole fume brands I wasn’t able to find and sample even on a trip abroad – like Neela Vermeire Creations, Vero Profumo, Jardin’s d’Ecrivains, Jul et Mad, Humiecki & Graef, Roja Dove, House of Matriarch…, I can go on like this forever…But I can boil it down to 3 somehow: Onda by Vero Kern ,in any concentration, Wilde by Anaïs Biguine and Blask by H & G.
Wow, that is so generous of you! I paused my hunt for smelling new stuff for a while to enjoy the collection I already have. I am getting ready to start sniffing out new perfumes, so this giveaway comes at a perfect time. On my to smell wishlist are Neela Vermeire Ashoka, Vero Profumo Mito and Stéphane Humbert Lucas 777 O Hira. Thank you for giving us the chance to win this generous gift Birgit. 1- Andy Tauer’s Orris… some say it’s one of the best scents ever! Thank you for such a generous giveaway! I always wanted to sniff Guerlain’s Parure, the original Coty Chypre, and Armani’s La Femme Blue. then and now just thinking about them transports me to another place. Norell created in 1968 and Guerlains Jardins De Bagatelle to name a few . How wonderful! Winning this would be amazing! I’m really curious about the Vero Perfumo line, particularly Rubj. Roses have been a huge craving of mine recently and I take ’em in my skincare in any shape and form I can get, so April Aromatics Rosenlust is one that I would really love to smell. Lastly, Apres L’ondee in extrait since I love the EDT so much. An old one: Vintage Chanel Bois des Iles – I would love, love, love to smell the original. Any old one: A good vintage of Guerlain L’Heure Bleue – seems I am too late to the perfume party to be able to smell this beauty at her best. A current one: Chamade parfum, since there’s something in the EDT that captures my attention, but it takes 3 or 4 hrs to bloom on my skin. Wow, that sample collection looks impressive! I would love to be entered in the draw! Three perfumes, I have always wanted to try: Chanel – Bois des iles (extrait), Guerlain – Nahema, Aftelier – Secret Garden. What a amazingly generous gesture. So interesting to see other people’s lists. Let’s see, three things I’d love to smell and never have: L’Heure Bleue by Guerlain, Flor y Canto by Arquiste, and Rubj by … well, you know! Jubilation for Women by Amouage, Amour de Palazzo by Jules et Mad, and Unter den Linden by April Aromatics! What a fun and generous giveaway! My “want to try” list is very long! Three that come to mind are Djedi, Providence Moss Gown and absolutely anything by Neela Vermiere! Thanks so much! Les Nez Manoumalia, Miller Harris Fleurs de Sel, and Reminiscence Patchouli. Thanks for the generous giveaway! I am a recent subscriber to your blog who for the past week has been engaged in the very plesant business of procrastinating at work by reading through all your archived Monday Questions (you really have a knack for those, you know) and reviews. I am selective about which blogs I subscribe to and part of the appeal for me here is your gracious online demeanor and clear openness, both to others’ opinions and experiences and to gently “working on yourself” to see if you can stretch the boundaries of your own tastes and desires. As I strive for openness in both those respects, I salute you and follow your writings with pleasure. As to the (astonishingly generous) giveaway…would you believe I have never smelled any Frederic Malle? His whole line could take up all three slots in my list but let’s say for now the Parfum de Therese. Next let us say anything by Mona di Orio, as I have not tried her work either. And finally, it’s not niche I don’t think, but didn’t Francis K create Rose Barbare? My apologies for the typo/excess bit at the end of my post; I am using a cumbersome phone to compose my reply. only three is a tough choice! but what an excellent idea! the Vanilla from Farmazia SS Anunziata! My Goodness! That is very generous of you! I’ve never smelled any Frederic Malle! On top of my list are Lipstick Rose and En Passant. I’m also very intrigued by the whole Vero Profumo line, especially Mito and Rubj I think. Voile d’Extrait… sounds lush! I love your reviews, by the way! What a generous draw! Its hard to narrow it down to three, but I’ve always wanted to sample Serge Lutens Un Lys, because I love lily, and any number of the Amouages including Gold Man (I love the women’s version). Guerlain Nahema is also up there on my “to try” list. Three perfumes I would love to try include 1000 Flowers Reglisse Noire, Providence Moss Gown and Tabac Citron are the top of my very long list right now 🙂 Thank you so much for the generous giveaway! Wow. How exciting! Thanks for the giveaway. I would love to try O Hira, Ormonde Jayne’s Nawab, & Jicky. Thank you for the giveaway! What a great giveaway! Thank you for doing such a generous thing! Gold Woman, Serge Lutens Bas de soie and BYREDO La Tulipe. I would love to try SSS Yin and Ylang, vintage no 22 and the original (pre-reformulated) Calyx. WOW !!! What a generous draw! And, the same much I wish to smell the Serge Lutens Palais Royal line. And the Hermessence line…. and Hiris…. The Arquiste fragrances… The Chanel Exclusifs… Mitzah from Dior….and a lot of vintages… in no particular order…. Such a great giveaway! I’ve always wanted to smell Guerlain L’Heure Bleue and Jicky and L’Artisan Parfumeur Séville à l’Aube. Thank you so much for this giveaway! Thanks for another generous giveaway. I have not tried anything by Roja Dove, Neela Verneire or Vero Profumo but would love to one day. I would like to try: Caron – Acaciosa; Van Cleef & Arpels – Murmure, Hind Al Oud – Kohl. I was born in Cologne Germany, is it any wonder i am fragrance obsessed? 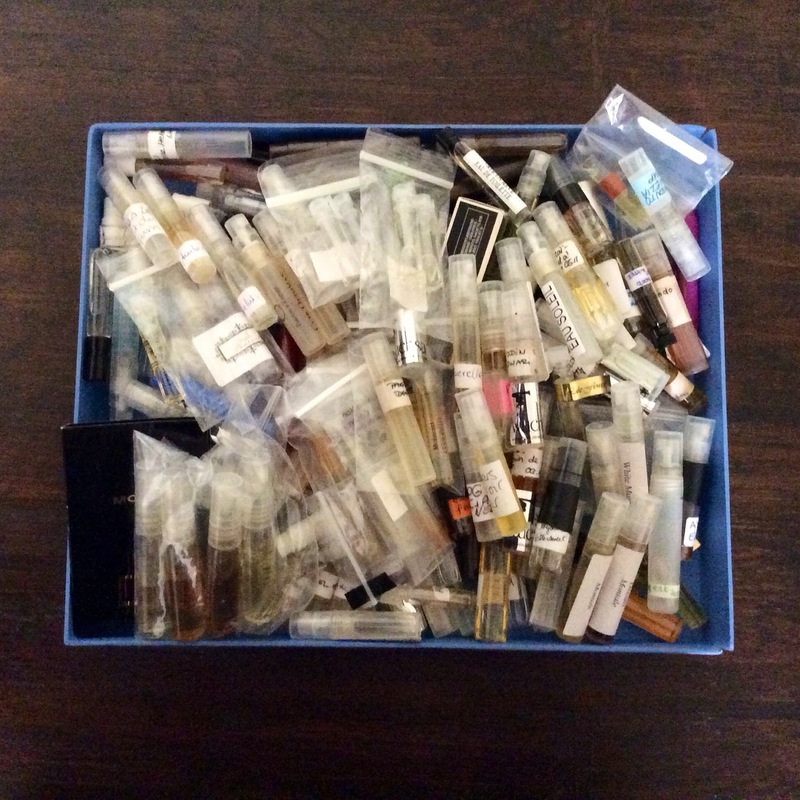 Thank you for the chance to win an enviable stash of samples! I’ve been curious about the Roja Dove line (I’m not even sure how to pronounce it) and I have yet to experience an Amouage Attar. Amazing idea!! Top three Norne – slumber house, König – yoshi and Mosiac -imaginary authors. I’d love to smell Diorama and Shalimar in vintage, and 100’s of others, especially a lot of the niche perfumes that are hard to find, basically I need to organise a perfume trip to Paris! What a generous offer. I’m a semi-novice studying perfume and I work in the bath and body products industry. This summer I’m doing research and smelling everything I can and also reading anything that has to do with perfume, it’s history and how it’s made. It’s pretty exciting & I am loving it so far! I hope to begin producing fragrance at some point in the future…when I’m capable enough. I’d love to smell Byredo’s Sunday cologne, Balenciaga’s Rosabotanica and LM Parfums’ Vol d’Hirondelle. Holy Macarel! What a stash. Three things that I am dyyyyying to try: believe it or not, I haven’t smelled Chanel Eau de Cologne. How is that possible you ask? No idea. I love all the other Chanels, even 1932. Would also like to try Tauer’s Rose Vermeille. And I’d kill to try those new Le Labos, especially Ylang 49. And the Aedes de Venustas Iris one. And Amouage Journey. And the newer version of Viollete in Love by PdN (love the original, but I’m not sure if it’s been reformulated). And Tom Ford Neroli Portofino. I could list things all day! Thank you for the drawing!! What a generous giveaway indeed, as many previous posters have said. No need to enter me, as I would be overwhelmed to have that many samples to test on top of my own miscellaneous stash-ettes dotted about the place! What a tremendously generous giveaway, thank you so much for this opportunity. I never ceased to be touched by the kindness of the perfumista community. I haven’t tried anything by Roja Dove, so I’d love to remedy that. Also the original Coty Chypre and Houbigant Fougere Royale. The latter two I’m sure I will have to make a journey to The Osmotheque to try! Awesome giveaway.. I never tried any of Niche parfumes. I would love to. Wow this must be a dream foe every newbie in perfumeland. Thank you for this generous gift. The three perfumes on my wishlist to try are, Bombay Bling – Neela Vermeire, Phi une rosé de Kandahar- Andy Tauer and Ormonde Jayne Woman. Stephanie de Saint Aignan Voleur des Ciels. The parfum’s I would like to try either cease to exist or are hard to find, It would be sheer luck if one of these pop up in your amazing giveaway. The first is Snuff by Elsa Schiaperelli long gone, but what intrigues me is that it had a tobacco base and the glass bottle was shaped into a pipe. A piece of pure art and by the sounds of the ingredient’s it’s made up of it would have been a personal favourite without ever trying it. The second is Royal delight by Creed, I had the opportunity to smell this once in a Creed store only to automatically fall in love with the creation and the story behind it of the spanish queen exiled for creating it for her lover. Finding it to be the only parfum I liked in the store suprisingly the storekeeper told me that it was discontinued and couldn’t be purchased anywhere. I tried to purchase the sample bottle and was unsuccessful. to be able to own a bottle or be able to smell this again would be a delight! As there are many other’s I would also like to smell, this one stay’s close to my heart as it was a personal favourite in my youth and i’m suprised that the house of Gucci could ever discontinue this creation.Gucci Envy for men created under the helm of Tom Ford, I liberally had worn this on a daily basis and I speak to a lot of other’s who had the same connection for it’s unique headiness that was a positive standout when you walked into a room being deemed unforgettable. As these maybe difficult to get hold of the opportunity to be able to sample some of your collection would be amazing as I may find a new treasure to enjoy and share amongst our meetup community Australian Sydney perfume bloggers. Thanks for the opportunity to share and express the love of olfaction! Thank you for the great draw! I would love to try Le Labo Vanille 44, Guerlain Rose Nacree du Desert, and L’Eau d’Hiver Frederick Malle. It’s such fun to read these lists of must-smell scents. I have been waiting for a chance to try wearing Eau de Bonpoint, Eau de Rochas, and Eau Sauvage. Spring makes me wish for sparkle and citrus. Thanks for the generous drawing! Birgit , your generosity is only exceeded by your kindness and beauty. Thank you for hosting such a generous draw. I would love to try these three: The Afternoon of a Faun by ELDO, Mito by Vero Kern and Hedonist. These are today’s picks, my choices tomorrow may vary. I have yet to try two of the great classic Guerlains, Mitsouko and L’Apres Ondee; and I want to try all of Neela Vermeire’s scents! Finances haven’t allowed many perfume treats this year. Thank you for entering me. Eeek, that is one big box o’ samples. The 3 niche perfumes I would like to try are DelRae Wit, Niki de Saint Phalle and Roja Dove’s personal perfume. Thanks for the generous draw! wow, this could be a BIG hit- so wonderful to give this away, B. What a great idea, Birgit! Thank you so much! I would love to try L’Eau d’Hiver Frederick Malle, Hedonist by Victoria Minya, Black Saffron Byredo and Cuir Mona di Orio. What a lovely idea Birgit, thank you for your generosity. There are a lot of scents that are on my to try list, but some are just too hard or too much hassle to get over here in Europe, because a lot of perfumers don’t ship international from the US. There are some really interesting houses in the US, but alas. Yin/Ylang by Sonoma Scent Studio. Have a great weekend everyone, fingers crossed! How generous, the picture of your treasure chest looks so wonderful – I can detect lots of Wuchsa ones in there… – and makes my heart beat faster…won’t you miss them??? Wow, and I thought my little satin box of samples was something! Like several posters above said, it’s hard to pick only three from my wish list, but the first three which came to mind are: L’Artisan Safran Troublant, Vero Profumo Rubj, and Guerlain Bois de Armenie. Good luck, everyone! Oh my God. This photo mesmerizes me. I’d be happy to discover so many new perfumes. This is not just a box, it’s a sea of ​​Travel! The three fragrances that I would like to try (hard to choose, so many perfumes I wish to try): Rouge Assasin Jovoy Paris, Andy Warhol Silver Factory Bond No 9 and Cuir de Nacre Ann Gerard. Hello! Thank you so much for this generous giveaway! It is too kind of you. On the top of my to-try list are Vero Profumo Mito, Guerlain Nahema and Parfums de Nicolai Odalisque! That’s a lovely and very generous kind gesture. Please enter me for the giveaway. I have always wanted to try FM’s Carnal Flower, Tauer’s L’Air Du Desert Marocain and Parfums de Nicolai’s Odalisque but they are not readily available where I am from. Thank you. My current must sniffs are Parfum de Empire Equistrius, Vera Kern Mito, and Guerlain Vol de Nuit. Wow – that’s a packed box and a very generous giveaway! I really want to smell Trayee, Rozy and Nicolai’s Amber Oud (just the tip of the iceberg though). My three scents to sniff are S. Maria di Novella “Frangipani”, “Oleander” also by S. Maria di Novella think it’s discontinued and Mandy Aftels “Cuir de Gardenia”. Thank you SO MUCH for this truly amazing giveaway!!!! 3. Vega by Guerlain also! Ooohhh, there are so many I want to try! Chypre by Coty, Chypre Palatin by MDCI Paris, and Une Voix Noire by Serge Lutens. Out of so so many other fragrances I have wanted to try for a while, these are the three that seem most elusive. hi, this is a truly great lot! I sometimes think that i love samples more than a full-sized bottle 🙂 i would love to smell all leather scents there are in the world, and to finally find my own one! There are millions but…Christopher Street by Charenton Macerations, Narcissus by CB I Hate Perfume and Skin Graft by Phoenicia Perfume (this is perhaps my most wanted perfume right now!) but also the hole MDCI line, JAR, Sonoma Scent Studio…etc, etc, etc. Wow! That is very generous of you, thank you for this opportunity. Hi Brigit! I have always wanted to try Caron En Avion, serge lutens Borneo 1834 and Chanel cuir de russie. Those are a lot of samples, so generous of you! Hi, I’m from Vietnam, it’s not easy to get a sample of Andy Tauer, many of L’artisan/Annick Goutal/Serge Lutens and vintage perfumes here. This is such a generous giveaway, I really appreciate your kindness! I hope this giveaway will be shared for all the perfume lover in our group in Vietnam 🙂 It’s not easy to discover niche and vintage perfume here. I’m dreaming about the big offline in the future ! What a generous offer – I’m delurking :-))))) ! what an amazing opportunity – thank you! This is an amazing giveaway! At the moment I have Ann Gerard and Pappillon perfumers on my to try list. I am also curious about Feminite du Bois. I recently bought his Vanille de Bois and I am so smitten. My collection is quite small yet and as a student my budget is limited. If I receive that package I will promise to try them all and really give them time to reveal their beauty. If not on my own skin then on someone I know. I just love scent-matching. This is such a generous giveaway, be still my covetous heart! I have been on a huge vetiver kick lately, I practically bathe in Jo Malone Vetyver every day. I would love to get my mitts on the original formulation of Guerlain Vetiver, Frederic Malle Vetiver Extraordinaire, and Hermessence Vetiver Tonka. Amazing collection of samples! I’ve been wanting to explore the Tauer line more, very curious about Carillion pour Une ange, the love for Neela Vermeire has me very interested in her line, so maybe Bombay Bling, more of the Serge’s as well, Encens et Lavande is on my radar. Thanks Birgit. Oh my! what a glorious hoard of magic! There are so very many things I’d love to smell–I’m fairly new to discovering perfumes and finding my way, but three niche scents in particular I’ve been wanting to smell are Lutens’s Un Lys (because I’ve not yet found a knock-me-down lily, and oh how I love lillies), Malle’s Portrait of a Lady (partly for the name because I love that novel, but mostly because it sounds like a terrific lush rose), and Byredo’s m/ink (for the strangeness, and the dark). Goodness me, that is a serious stash of samples! I think I’d most like to sample niche American perfumes, having read blogs praising Dawn Spencer Hurwitz and Neil Morris and Ellen Covey, to experience what those independent perfumers are creating. Thank you for such a great contest! Thank you for this exciting opportunity. 🙂 Many thanks as well for the daily pleasure of reading your blog! Every post is truly an inspiration and a relaxing voyage toward the beautiful. In the serene summer evening, when your soul is at rest, when the nature sighs gently after a hot day, and the evening flowers slowly blossom, I start to think about L’Heure Bleu which probably smells exactly like this. I’ve read so much about it that I get a feeling of knowing it well, as if I’ve worn it already, although it hasn’t actually happened. Many people write that this twilight perfume smells like sadness, loneliness and rumination. I find it attractive and slightly repelling at the same time. I’m waiting for the moment we’ll meet, I know it will come. I believe that this legendary perfume will not disappoint me. Summer always makes me want something unthinkable. I want something that’s both gentle and noticeable, refreshing and exciting, but does not disturb anyone around me. Cote d’Amour L`Artisan Parfumeur might just be the right aroma. I’ve known about it for several years now, but we’ve never met. I imagine it like the sea that is always nearby. Sea salt, sea algae, fragrant grass on the shore. It will surround me with its light mist, create the vacation mood, give me the feeling of a brown, rested body. It’s like sitting on the sea shore, touching the sand, listening to the sound of the waves and the seagulls. It’s so wonderful when you have things to dream of. The world is woven of scents. We recognize the loved ones, one’s home, our favorite places by the way they smell. Every country has its olfactory face. If you’ve known it once, you will never confuse it with anything else. I’d like to visit Morocco so much, just as much as I’d like to make acquaintance with L`Air du Desert Marocain Tauer Perfumes. I imagine this perfume as the hot air that somehow leaves sand in your hair and clothes. I see myself walking through the narrow streets of Marrakesh, surrounded by the smells of spices from little shops, of fresh vanilla pastry, of mysterious smoky fragrances. These images make me want to encounter L`Air du Desert Marocain as soon as possible. Thanks for the chance, dear Birgit! Three perfumes I have always wanted to try but have not had the chance yet are Musc Ravageur Editions de Parfums Frederic Malle, Chanel Cuir de Russie and The Different Company Rose Poivrée. It is so generous of you! Here are the fragrances I’ve dreamt of smelling for quite a while: Chanel Bois des Îles, Chanel 31 rue Cambon and Guerlain Jicky.